I've recently begun a new "Nostalgia Series". Here are the first two completed pieces. A vintage velvet photo album cover from the 1900 World's Fair in Paris graces 'Nostalgia' pictured on the right. The weathered hand carved top of a child's chair works as a frame. 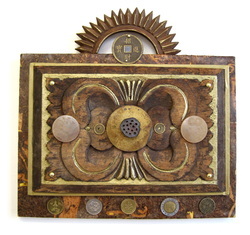 Star Anise seeds, Mahogany pods, coins and beads are some of the elements. The main ingredient of 'Radiant' on the left, is an old wooden carved pineapple panel that I enhanced with paint, lotus pod, buttons, coins, and cork wall paper on board. Click on image for more views.